It’s easy to warm up to Diljit Dosanjh. He is endearingly street-smart and the archetypal guy-next-door who can surprise you with his ability to change from naïve to knowledgable within no time at all. The type whom you can ask in a house filled with women to come and fix the sink. Something like what Dhanush played in Aanand Rai’s Raanjhanaa, provided Dhanush could be a Sardarji. To cast Diljit as an affable, somewhat over-bearing, insurance agent who leads a double life, is a scriptural master-stroke , and full credit to writer Dheeraj Rattan for casting Dosanjh in a role that doesn’t flatter to deceive. Dosanjh is the glib-talking simpleton Ambarsariya who fifteen minutes into the film, throws off the mantle of naivete to reveal his hidden identity. Once we know Ambarsariya is a RAW agent appointed to secretly to eliminate terror threats the film becomes a fun-filled super-hero comedy where Dosanjh’s Clark Kent is an insurance agent and he doesn’t need to wear his underwear on top of his trousers, only his heart on the sleeve, to get the audience interested in where the innocuously zonked engaging narrative will head , once we know Ambarsariya’s latest mission. By the time the very lithe Lauren Goetlib shows up as one of the prime suspects in the assassination conspiracy we know everyone involved in this film is in it for the fun. Taking out the political thriller from its grave habitat into the zone of the zany is a job of the blithe-hearted. With Diljit Dosanjh unafraid to look goofy and silly on screen, something like Amitabh Bachchan in Namak Halaal, but far more impetuous in his obstinate disregard for the rules of screen heroism, the mood of revelry never stops even when the proceedings get overpoweringly absurd. The entire film, shot lovingly in the city of Amritsar conveys a sense of bonhomie even when the topic of terrorism crawls into the narrative. 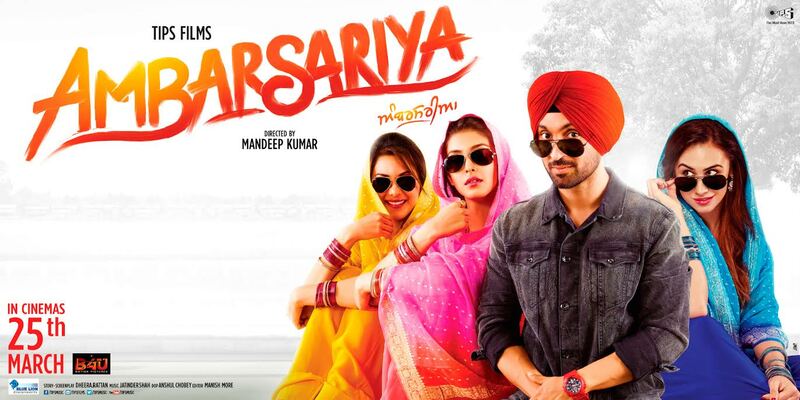 Ambarsariya is a likeable joy-provider of a film. Nothing serious is gained, no big losses incurred in the quest to give the film’s star-attraction some reason to unwind and freak out.Dosanjh has a number of ladies for company here.He’s cocky but never leery with any of them. Of them, Lauren with her dancing skills and dancing eyes matches Dosanjh’s mischievous screen presence. And her Punjabi is better than Katrina Kaif’s Hindi! Gul Panag as Dosanjh’s boss at the RAW agency instils some unscheduled spark and humour into her role. In fact the supporting characters augment Dosanjh’s street-smart act by letting him be heroic in the absurdust of plot twists. No one is advised to watch Ambarsariya for its homilies on terrorism and national security. Just flow with the free-falling fun of the hero’s crazy adventures. If you have enjoyed Diljit Donsanjh’s turbaned adventures in his early Punjabi films like Jatt & Juliet and Sardaarji, Ambarsariya would make you smile giggle and chuckle.This hero doesn’t need a cape to fly. He is high on life. 15 queries in 1.160 seconds.